(Nanowerk Spotlight) Theoretical studies have long predicted that the exceptional physical and chemical properties of a rigid monatomic linear chain of carbon atoms could function as the component of molecular devices, for instance in nanoelectronics. The problem has been that there was no reliable and effective way to produce these carbon chains and therefore scientists couldn't study them experimentally. While linear carbon chains have been already prepared either in solution or by vaporizing graphite, researchers in Japan have for the first time succeeded to derive the carbon atomic chains from graphene in a well controlled manner. "Our approach to realize freestanding carbon atomic chains employs energetic electron irradiation inside a transmission electron microscope," Kazu Suenaga explains to Nanowerk. 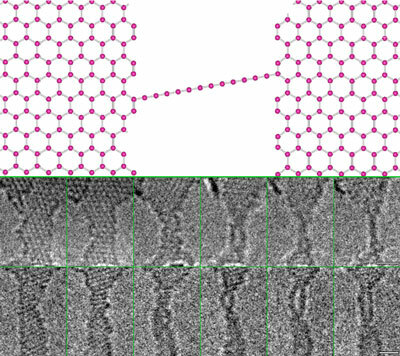 "A graphene nanoribbon was continuously thinned from its two open ends by removing carbon atomic rows. This thinning process stops when the number of carbon atomic rows becomes two or one. This way we could reproducibly fabricate single and double freestanding carbon atoms chains." Suenaga, who heads the Nanoscale Characterization Team at the AIST Carbon Center in Japan, points out that these chains show a remarkably good stability with a length up to a few nanometers even under the irradiation of energetic 120 keV electron beams. The AIST team reports its method in a recent paper in Physical Review Letters ("Deriving Carbon Atomic Chains from Graphene"), first authored by Chuanhong Jin, opening the door to investigating the practical use of all-carbon-based devices with the carbon atomic chains as the conducting channel. Suenaga's team is already working on experimentally examining the carbon chains and are preparing to make heat and electrical conduction measurements. Some of the theoretical investigations have already predicted that the excellent thermal and electrical properties which are comparable for the carbon nanotubes or graphene. A typical single carbon atomic chain that the AIST researchers fabricated has a length of about 2.1 nm – which corresponds to about 16 carbon atoms – and behaves like an elastic string with a quasi linear arrangement, which is consistent with theoretical studies (see for instance "Effect of electron and hole doping on the structure of C, Si, and S nanowires"). "We never found any abrupt junction corresponding to the zigzag- or armchair like configuration" says Jin. "Contact between the chain end and the graphene edge was not stable, and occasionally the chain end migrated discretely along the edge with atomic steps as if swapping the bonding atoms at the edge of the graphene. It should be noted that the carbon atomic chains always break at the endpoints where they are connected to the graphene, never in the middle." Although the potential applications of a carbon atomic chain are still unclear, such an ideal one-dimensional carbon chain can be regarded as an ultimate basic component for electronic devices. Suenaga mentions that the chains definitely show a quantum transport and one can therefore anticipate to integrate a million of the carbon chain devices just by patterning a single graphene layer. "This can be a real merit as opposed to the case of nanotubes, because the integration of nanotube devices on a substrate has turned out to be quite difficult," he says. The researchers expect excellent electronic transport properties for cumulenes (.C=C=C=C.) and we can therefore assume that carbon atomic chains can serve as outstanding sensors, since the electronic transport properties should be significantly affected by dopants and absorbent (such as some chemical or biological species). Carbon atomic chains may also find possible applications in logical devices, such as switches or bi-stable memory. According to Suenaga, the change of contact of such carbon chains with graphene has recently been proposed as a mechanism for the atomic-scale switches.